Hello, boils and ghouls! Today marks a very important anniversary! Yes indeed. 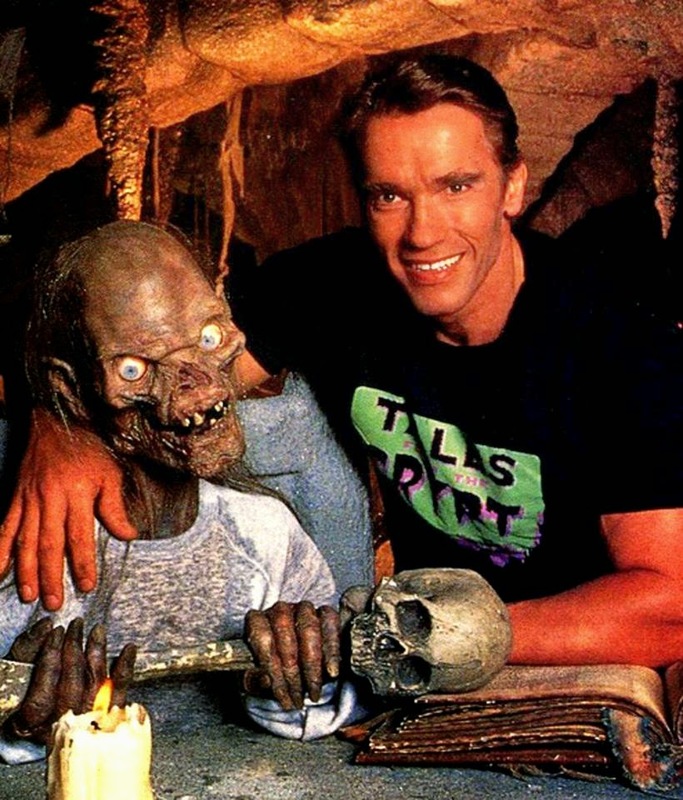 Today, June 10th 2014 marks the 25th anniversary of the very first episode of Tales From the Crypt hitting the airwaves! It was 1990. My Aunt Kay came over a weekend to watch my brother and I while my mom was out of town. My Aunt Kay was the "fun" aunt. She was the aunt that let my brother and I drink soda after 8 pm, let us watch R Rated movies, and most importantly, one fateful night, let me watch Tales From The Crypt. Yup. Tales From the Crypt. Along with Creepshow, the reason I love anthologies so bloody much. I mean, what's cooler than a crazy corpse telling different stories week in and week out? All it took was me not being able to sleep and joining my Aunt on our couch while she watched the episode "Four Sided Triangle" that involved Patricia Arquette falling in love with a scarecrow. I don't know why but something drew me in and after that night, I was hooked. My mother, on the other hand, wasn't the biggest fan and she had a rule that the first episode that terrifies me, I'm done. Realizing what a gamble that was, I agreed. Thankfully, as long as we had HBO(a few years), I never got scared and I was able to enjoy the series as long as I could. Great retellings of the old EC Comic comics in which evil is always met with a sweet demise or cruel and ironic fate. It was like actually watching a real life comic book and that definitely appealed to this young lad! With the biggest stars including Arnold Schwarzenegger, Brad Pitt, Tom Hanks, Michael J Foxx, just to name a few and the biggest directors hoping to become a part of this successful show, it's easy to see why it remained so popular for years well after it's cancellation. The series was released over the years on vhs in many volumes which included 3 episodes per tape. And finally, in 2005, the first season was released on DVD, with the following 6 season to follow over the span of a few years. Yours truly was there to pick up every season on the day it was released every single time and they currently sit on my shelf proudly. To this day, I consider it my favorite show of all time. No matter what series, I can sit, marathon and proudly enjoy it every single time. It seemed the 90s belonged to the CryptKeeper. He was everywhere! 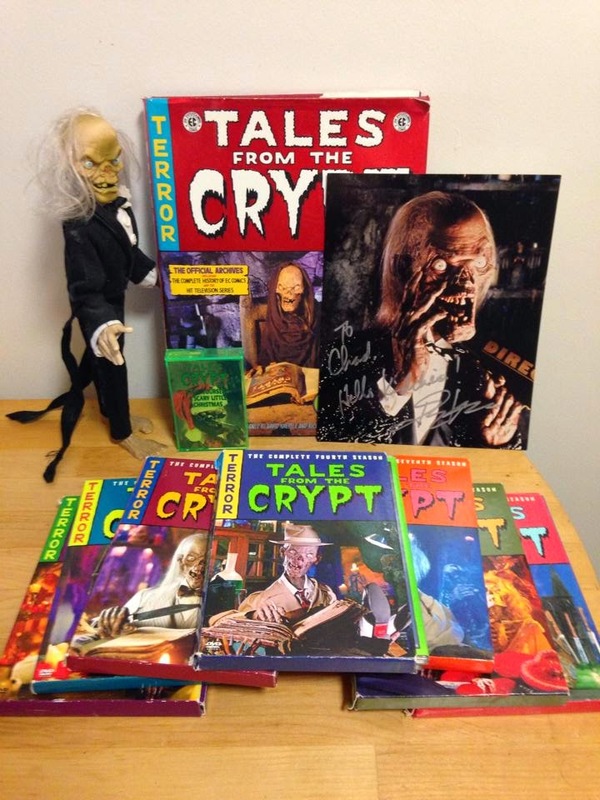 The manaical host, played amazingly by hysterical standup and voice actor John Kassir, became a household name thanks to merchandising that That includes the Tales From The Cryptkeeper cartoon, which I hated even as a kid because I thought it was nothing more than a horribly watered down cartoon. At the same time. 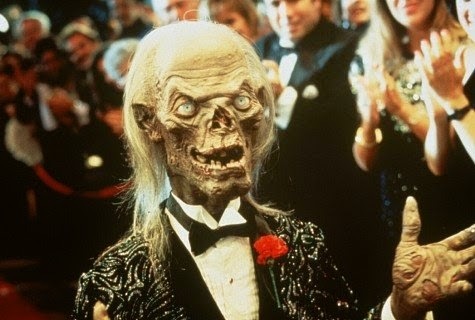 it was good to see The Crypt Keeper on tv and being so widely available to all age groups. A game show on CBS in 1996, Secrets of the CryptKeeper's Haunted House, would follow. I liked that a little more than I liked the cartoon. I don't know why, but I did. I gotta admit though, there's something super awesome about having a twelve inch talking Crypt Keeper doll on my shelf spouting out goofy lines and right below the shelf is a cassette tape of the Christmas themed "Have Yourself A Scary Little Christmas". So many other items including trading cards, action figures, Budweiser bar items, shirts, and so many other items that I could sit and list but we don't have that much time. I suppose stuff like that also helped it to become my all time favorite tv series. 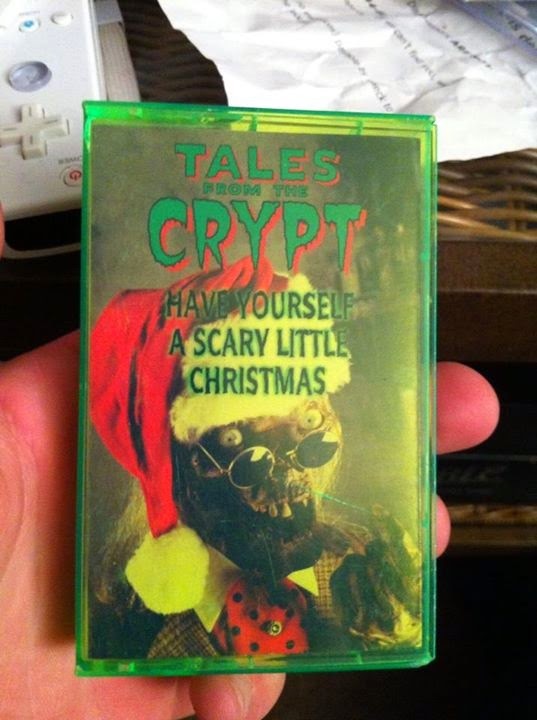 A sample of my Tales From the Crypt collection! 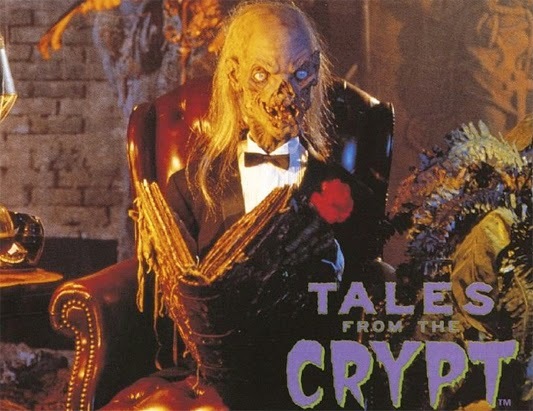 Tales From The Crypt debuted on June 10th 1989 and I don't think anyone truly knew how huge it would become and what an impact it would have on horror as a whole. But, it's legacy of being this generations Twilight Zone is a description that speaks for itself. So, happy 25 years to such an amazing show, Boils and Ghouls! Awesome! It's most definitely my favorite show of all time as well. No matter how many times I watch the various episodes, they never get old. Happy 25th birthday to Tales from the Crypt, indeed. NOW Is The Time For Ecto Cooler To Return!